When you're driving through the suburb of Woolwich, you may be forgiven for getting a slight case of green eye envy. The homes are large and well kept, the streets are clean and lined with trees. The area oozes laid-back wealth. Whilst living in the area may be out of reach for many; you can still feel like a local with a trip to the Deckhouse. 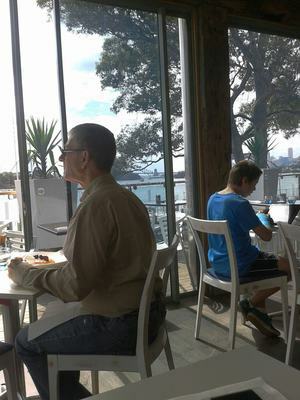 Both al-fresco and indoor tables are available, all with magnificent views. Only the jetty and some grass lies between you and the harbour. The walls are floor to ceiling glass allowing inside diners unobstructed views of the blue harbour whilst you enjoy your meal. It is no wonder that the venue is popular for wedding receptions and has sold out for consecutive New Years Eve celebrations. My younger brother found it amidst the schmoozing of senior executives whilst on the graduate job hunt and it became his regular 'butter up the boss' location for an afternoon coffee as the semi-hidden location maintains a certain level of exclusivity. The two times we have been for brunch have been exemplary. Service is attentive without being overbearing. This is the sort of place where your waterglass is refilled for you, yet without any sort of pomp or show. On my first visit I had the big breakfast as I was extremely peckish. On my second trip, I had the eggs Benedict as did the majority of my table, although there are many items to chose from. 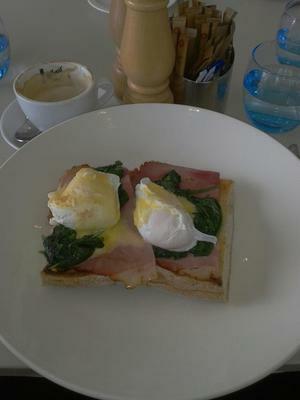 The bread was soft and fresh, eggs were beautifully done and the coffee was of good quality. The only disappointment was that we were unable to substitute the mushrooms in the big breakfast for another item; instead having to pay an additional charge if you wanted a second tomato, hash-brown or sausage instead of the funghi. You get the idea. For a table full of mushroom-dislikers, this was not ideal however did little to weaken our perception that the staff were friendly, efficient and knowledgeable in their product. Paying $20 for your weekend eggs is not something I would do all the time so I would reserve this particular venue to a special weekend, or one where you wish to impress. The view is the main draw-card of the venue (which is understandably closed at night in winter). 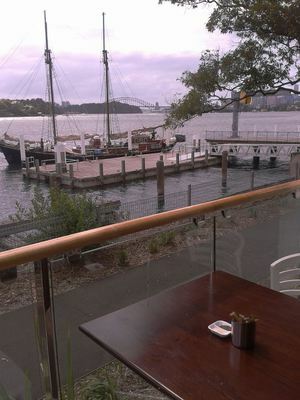 However when I one day have the budget for a lovely local house up the road you will no doubt be able to find me at the Deckhouse for a warm, waterfront breakfast.